Our conversation with members of GICAS in our creative lounge has opened our eye to look at the full circle of Life and how every decision we make can impact us and all the people that are close to us. This also includes our family and friends as members of GICAS. Every day we come here to our Creative, Meditation & Poetry lounges to share our genuine concerns and views, whether it is about Art.., or simply to acknowledge that we are alive.., sometimes we maybe having a good day the other days we have when everything keeps going wrong and nothing go as planned. Before we can help other we have to clear our own minds and look to bring perfect balance to our lives. Therefore these situations are for us to stop and question as artists we should be more in tune and sensitive of nature, changes of seasons, light.., colour.., as true observer of Life.., as a true artists for the humanity and mankind. We are pleased to hear from members wanting to organise an event to celebrate our first anniversary with a World Peace day meditation program that could influence and bring healing from our own efforts. Our Foundation day is 19 August 2012, therefore confirm the following date and times to organise the whole family of GICAS and our guests to join us on Sunday 25 August international UK times from 11-30am to until 3-00pm. Everyone participating to join us between these times we all could all link together around the globe to complete the healing and peace meditation as our joint contribution. For this to make a big impact we each have to complete our own individual program of minimum of 20 – 30 minutes seating quietly on a comfortable chair, a place where you will not be disturb. For members who find it difficult to concentrate to use the option 1 visualization technique of closing the eye imagine you are at a place were there is water flowing over waterfall or looking at the waves at the seaside and enjoy the movement and sound of water to settle and relax the mind. After a settling down with your breath technique feeling calm and peaceful to gradually move to introducie a deeper visualization technique of seeing light flowing around the body – the colour of light being Blue moving up and down from the head to your toe as you breath in and out.., all this should be done without any effort just relax and enjoy the experience.. If you would like to try doing your own practise exercise that will be good to help you settle down and understand the process and ask any questions that comes to mind before the BIG DAY. If we use our communication medium of our meditation lounge this would be useful for all the members to share each other experiences. We would request all members and guests taking part in our event to completing the practise on Sunday by viewing our You Tube video of our first anniversary celebration. This will confirm live of the number of members who complete the program. Thank you for taking an active role in all our events. This is very positive and exciting time for us all!! As I think of this gesture for peace two great icons come to mind, Gandhi and Martin Luther King. My meditation would be that such a person is born to every country in the world within my life time and that we all come to understand the commonality of human aspiration for freedom and peace transcends all cultures. Sunil count me in as well ,on the World Peace day meditation. To send “the greater impact peace and harmony we could all send around the globe”. I have viewed the YouTube First celebration video. Will participate on Sunday CST USA.. As a follower of the Baha’i Faith, it is obligatory to meditate daily. My hope is that GOCAS members that send their(Peace & Harmony) will come to the realization, that they will be rewarded in kind on this plane or the next. For all of us to thrive. And putting us all in need. And by which all can thrive. And every atom, seed and sun. They are, in truth, all one. I Ching, Kabala and other codes. Where all systems can remain whole. On what we need to know to thrive. But to true up the vortex that we’re in. In bringing real change to pass. And move when there’s critical mass. In our journey through eternity. We truly all can thrive. Pablo what a wonderful poem. Full of your wisdom and insights into our contemporary world so in need of peace and harmony. 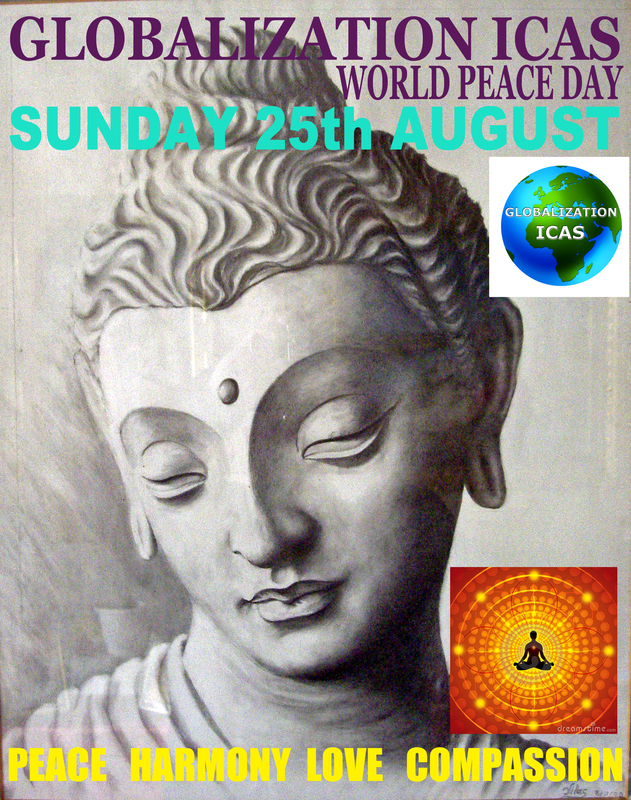 Hello to Sunil and all of the members around the world who have participated in our Globalization ICAS World Peace Day! Although, because of the time difference, I am a late starter I have enjoyed meditation today and visualizing World Peace! I send Love and Light to each of you and lots of warm golden light to encircle our world and bathe people in Peace, Love, Understanding, Harmony and Compassion. To each individual person, I send sparkling blue clear light to fill and energize each body with creativity! And Hugs from Laara! Laera Your comment sums up my feelings. It was a wonderful day of enlightenment. Perhaps we should all do this move often. For me there is an 8 hour difference so I entered later than most of our wonderful friends. I didn’t log into our site but I did the meditation. I hope that was ok. The Meditation today was wonderful for me. I am not trained, but somehow I manage to meditate. What I felt today was soft waves of love, hope & creativity in the form of delicate colors moving , touching & learning,from each person. I always have a visual when I mediate, today I was seeing the fantastic 3D clouds that were always in the Nevada Sky. These clouds were the best I’ve ever seen & each time we went to the desert i was totally serene. I took about 1,000 photos in these restful, peacefull environments. Meditation quieted my mind; I withdrew from the routine to face the future and experienced a mild breeze with fragrant surrounding gradually engulfing me. It remained for some time and I was not aware that my eyes were closed; The moments over and when I opened still the mild breeze persisted; as if I had the Grace descended from somewhere. I closed and became prayerful; Sunday evening was colourful with roving designs that joined me with the Fraternity. Hi guys, I can’t leave you a moment that combined damage. Edgar, was a beautiful woman I would understand but a man, no. Seriously Fortunately all went well, this makes me feel happy. Meditation, for me it was the first time, at the beginning a little discomfort then I relaxed and my mind if emptied traveling in vacuum, as saying a sleep/awake, a beautiful esperinenza. Sunil I already answered to the question of Luli, I say that the line will go where heart, mind and honesty I must go. It comes back to Aristotle, I do study philosophy, in school I had a vote, it was not my forte. But I will and I will try to carry out the task. Thank you all and wish you a good week and I recommend not combined damage.